Gamini Bandara retires after 33 years of loyal service. Everyone owning Sega machines know this brilliant technician. Gamini began his Amusement career as technical support manager at Tech-Mar Leisure Services (Ruffler & Deith Leisure Company) in 1979. From 1980, he takes care of technical support and distribution of Sega products. His expertise will be put to use in the design of European versions of Sega hits like OutRun, Daytona USA, Manx TT, Sega Rally 2, Derby Owners Club, The House of the Dead, Virtua Fighter and Virtua Striker series, and most recently Sega Golden Gun and Sonic & Sega All-Stars Racing Arcade. He also designed the movements of Cycraft versions of Initial D Version 3, Club Kart and F-Zero AX Monster Ride. He visited Belgium several times, including for the installation of a Derby Owners Club at Sportland in Blankenberge or during Namusco open days in Brussels. He was always of good advice and enjoyed sharing his enthusiasm and knowledge. 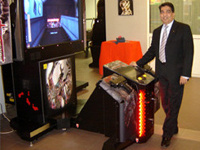 Gamini Bandara has left his post as Technical Service Manager at Sega Amusements Europe this April 5. Now he can enjoy a well deserved retirement to relax and live his passions... We thank him for everything and wish him much success in his new endeavors! Stunfest's eighth edition will open its doors in one week. Each year, this video game festival organized by 3 Hit Combo gathers thousands of players in Rennes (Brittany). 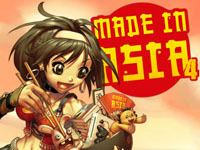 This event is famous for its tournaments attracting players from throughout the world. This year, arcade tournaments are Garou - Mark of the Wolves, Super Street Fighter III 3rd Strike and Super Street Fighter II X. Tournaments are commented by Ken Bogard. Registration fees range from €5 to €7. Many other arcade machines will be available to the visitors. Music will be granted by live concerts of (mostly) chiptune artists: TH' Mole, DATA Glitch, 2080, Rauberhohle, Jankenpopp and Nate &amp; Jojo. Conferences around the video game theme are organized with themes like "video game and its culture in contemporary Japan" or "heritage conservation and transmission of videogame culture". Note also the presence of independent game developers. Stunfest XII will take place at Halle Francis Querné in Rennes (France) from April 13 to 15. Entrance fee is of €7 a day, €12 for 2 days, and €15 for 3 days. 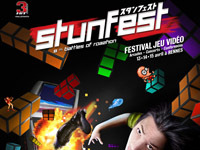 The event will be live broadcast on stunfest.fr. 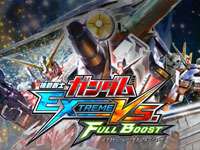 Namco Bandai releases today the highly anticipated successor of Mobile Suit Gundam Extreme VS.: Mobile Suit Gundam Extreme VS. Full Boost. In this new version of the mechas fighting game, no less than 74 Gundams are already announced! 2vs2 fights take place on 17 stages from the wide Gundam world. The game runs on System 357 and has high-quality graphics. The matches can be broadcast on a live monitor. The mechas are still purchased with points earned in the game and they come from the following series, movies and mangas: Mobile Suit Gundam, Mobile Suit Zeta Gundam, Mobile Suit Gundam ZZ, Mobile Suit Gundam: Char's Counterattack, Mobile Suit Gundam: Char's Counterattack - Beltorchika's Children, Mobile Suit Gundam F91, Mobile Suit Victory Gundam, Mobile Fighter G Gundam, Mobile Suit Gundam Wing: Endless Waltz, After War Gundam X, âˆ€ Gundam (Turn A Gundam), Mobile Suit Gundam Seed, Mobile Suit Gundam Seed Destiny, Mobile Suit Gundam 00, Mobile Suit Gundam 00 the Movie: A Wakening of the Trailblazer, Mobile Suit Gundam UC (Unicorn), Mobile Suit Gundam 0080: War in the Pocket, Mobile Suit Gundam 0083: Stardust Memory, Mobile Suit Gundam: The 08th MS Team, Gundam MS IGLOO: The Hidden One Year War, Mobile Suit Crossbone Gundam, Mobile Suit Gundam Seed MSV Astray, Mobile Suit Gundam Seed C.E.73: Stargazer, Mobile Suit Gundam Side Story: The Blue Destiny, Mobile Suit Gundam Exa. 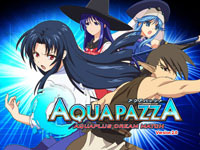 AquaPazza - Aquaplus Dream Match Version 2.0 is available today. Aquaplus added 2 new playable characters: Oboro (from visual novel Utaware Rumono released in 2002) and Chizuru Kashiwagi (from visual novel Kizuato released in 1996) and 2 new partner characters: Serika Kurusugawa (from visual novel ToHeart released in 1997) and Llyr (from RPG Tears to Tiara released in 2005). 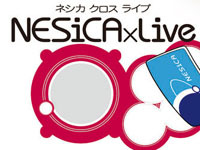 A new batch of titles is delivered on Taito's NESiCAxLive today. Among them are shmups released a few years ago on Type X such as Homura, Raiden III and Raiden IV for NESiCAxLive, in which a "Fairy" ship and a "Perfect" mode (7 stages) were added. It also includes remixed music. Taito and SNK Playmore have teamed up to re-release NEO-GEO titles: the first title in this "NEO-GEO for NESiCAxLive" series is none other than Puzzle Bobble for which there will be national rankings. And finally, Taito releases a new version of its classic Space Invaders: Space Invaders for NESiCAxLive. Spring starts well in Japan with three scheduled releases today: Baseball Heroes 2011 Shine Star Heat up Version, Dance Evolution Arcade and Tekken Tag Tournament 2 Unlimited. At first Konami updates the players database from its card game and adds 150 new cards. 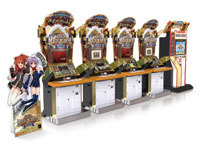 Also from Konami, the latest BEMANI game concept, Dance Evolution Arcade makes its debut today. In this dancing game, the player stands facing the screen and must reproduce the actions of the on-screen dancers. Two players can play simultaneously. 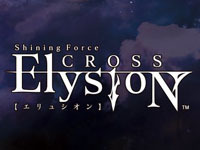 The title has benefited from location tests in Asia, so an international release might be possible. 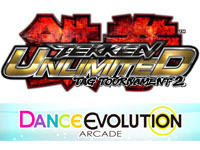 Finally, Namco releases Tekken Tag Tournament 2 Unlimited today, this update features a better charcters balance, a greater life gauge in solo mode and, above all, new game modes up to 3 (1vs2) and 4 (2vs2) players (two cabinets can be linked). The game was shown at the Amusement Expo (Las Vegas) so we can also expect a worldwide release. Today is a great day for fans of oldschool platformers since GunLord is finally available for the Neo-Geo MVS! After the Last Hope and Fast Striker shoot'em ups, German developer NG:DEV.TEAM switches to the Turrican genre where you have to explore nine huge levels in search of diamonds and other treasures. Unlike run n'gun games like Metal Slug, the action is not linear and levels extend in height and depth. You can count on different weapons (spread shot, ricochet blaster, rockets, flamethrower, ...) in your fight against the 45 different types of enemies and huge bosses. 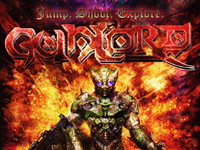 GunLord takes place in the world of Last Hope, the scenary is beautiful and enchanting with waterfalls, caves, and old statues and relics of extinct civilizations. All of this is served by a 5-layer parallax scrolling in constant 60 fps! You can see for yourself in the trailer available on YouTube. Two game modes are available: Original and Arcade. In Original mode, you have plenty of time to explore the world around you and in case of death, you reappear nearby, extra lives are scattered throughout the levels. Arcade mode is more difficult since there is a time limit and you must catch bonuses to adds time to the clock. Moreover, the loss of a life will send you back to the beginning of the level and the only way to regain one will be to find all the diamonds in the level. A password displayed on game over allows you to enter the online ranking. The MVS cartridge has a USB port that will be used update the game program through PC connection (bug fixes, additional game modes). The sole cartridge costs €319 but also comes as a collector kit for €419. This package includes a shockbox, two posters and a booklet. Both versions accept coins/credits and can therefore be used for operation. A nice way to revive an old Neo-Geo cabinet.